Rodney McAree says keeping Darren McCauley at Coleraine is paramount to bringing success to the club. The midfielder has been in sparkling form for the Bannsiders since McAree took over the reins. McCauley has notched up four goals in his last five games, including the equaliser in last week’s draw with Glentoran. McAree wants to tie the former Derry City man down to a new deal at The Showgrounds. “We have already started speaking to Darren about a new contract. “He is paramount to this club and paramount to us going forward and the success of the club going forward. “The goal against the Glens last week was his fourth goal since I’ve come in, and he took it so well again. “But him and Adam Mullan put in an almighty shift in that second half playing as wing backs, both attacking and defending. McAree will have to shuffle his pack this Saturday for what he called a ‘tough’ trip to Warrenpoint after Eoin Bradley’s dismissal last Saturday. But he feels it will give the likes of Jamie McGonigle the chance to come in and stake his claim for a starting spot. “Obviously we’ll have to make a change now with ‘Skiiner’ suspended, but it also gives Jamie the chance to get a place in the team again. “For the life of me I can’t believe a player of Jamie’s quality is not in the team. “It shows you the quality the teams has produced over the last few weeks. “Warrenpoint is a very tough place to go, especially as it’s a long journey from Coleraine. Point boss Stephen McDonnell is also expecting a tough clash at Milltown against a Coleraine side who are looking back on form again. He said that they will plan for dealing with the Bannsiders but also look to show their own qualities. 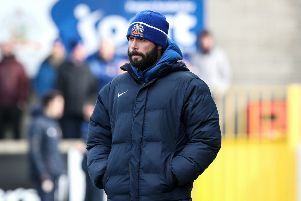 “They are another good outfit, we’ve got to treat Coleraine with the respect they deserve but stick to what we believe,” he said. ”We always plan around the opposition’s qualities but also play our own game. “I think don’t think we know our best 11, which is good and bad. “Many players will get opportunities so that keeps the squad happy and the important thing is to know your roles. “From a coaching point-of-view it’s a good tool to have that whenever someone gets into the team all the lads understand what to do. “We’ve signed guys to play one position in my head then we get them in and once we start working you see other qualities. “Simon Kelly has played centre-midfield, Mark Griffin has played midfield, Francis McCaffrey started up the top of the midfield now he’s holding and Eamon Scannell’s at full-back. “I’m more of a performance manager at the moment, without having that pressure of winning leagues or anything, so it’s important to see us getting something from games along with playing well. “Results will come if performances are right, which is natural, so I very much want the performance.